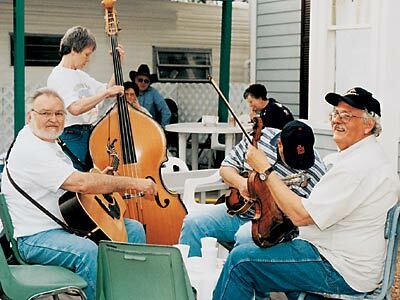 If you play an instrument, bring it along when you visit Mountain View, Arkansas. As you take an evening stroll through this cute little hamlet, you'll realize in no time flat why it's known as the “Folk Music Capital of the World”. People come from miles around to gather in the town square and perform impromptu concerts, or walk from yard to yard and listen to small groups performing mountain music. Most of the time, there's anywhere from half a dozen to 10 groups of musicians playing. This isn't a planned event. It started by happenstance years ago and now is virtually a nightly event (they move indoors during the cooler winter months). And if you have a guitar, fiddle, banjo or some other instrument, you're welcome to bring it with you and join in. No one here uses written music. Someone just starts playing a song, and the rest of the group goes along with the flow. “Naw, you go ahead,” came the polite reply. And no one missed a note as they played on. As we listened to another group in front of the Stone County Courthouse, a child interrupted one of the players. She stopped long enough to take care of the problem, then took off playing and singing again. It was one of the most down-home and refreshing things my husband and I had ever experienced. But Mountain View is more than just a pretty melody. This small town in north-central Arkansa's Ozark Mountains has loads of backroads country charm, too. Stroll around downtown and you'll see many unique little shops, selling everything from furniture and locally forged ironwork to antiques and musical instruments. Need a porch rocker or some handmade solid oak furniture? 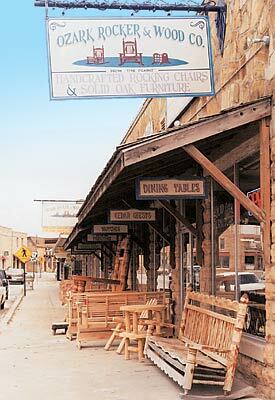 Then step into the Ozark Rocker & Wood Company, also on the town square. Be sure to have a seat on the extra-large rocker outside the front door. Don't miss The Old Mill, located one block west of the town square on Main Street. Built around 1915, the mill was restored by town residents in 1983 and is still powered by its original 10-horsepower, one-cylinder kerosene motor. A small museum displays old photographs and tools, and a shop in the mill sells handmade crafts, foodstuffs and cornmeal. All that shopping's bound to make you hungry, so head for Aunt Minnie's Kitchen. Be sure to try Aunt Minnie's famous fried pickles! For dessert, head over to Wood's Pharmacy, a 1920s soda fountain that also serves daily luncheon specials. After appeasing your appetite, stroll over to a unique little state park, the Ozark Folk Center. At this living-history attraction, you can see demonstrations of more than 20 different old Ozark crafts, ranging from blacksmithing to making pottery. You might even learn how to dance a traditional jig or play the Autoharp or dulcimer! Speaking of dulcimers, no visit to the area would be complete without seeing the Dulcimer Shoppe, just north of town on State Highway 5/9/14. You can watch George, Richard or Larry painstakingly create one of the 2,000 dulcimers they manufacture each year. 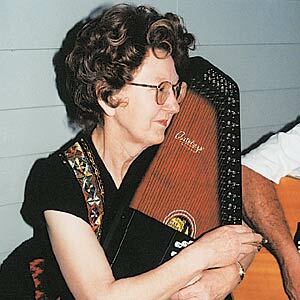 If you're wondering what a dulcimer sounds like, ask Jean–she'll be happy to play you a tune. A stone's throw away, you'll see a sign that reads, “White Oak Baskets by Leon Jennings.” As my husband and I soon found out, Leon is an 80-year-old retired postmaster who needed a hobby and discovered basketmaking. He's happy to show you his little red barn and demonstrate how he makes baskets, using trees he cut down himself, an old-fashioned drawknife and a homemade horse. A little farther down the road, you'll spot Mellon's Country Store, a two-story white building that'll instantly transport you back to the 1940s. This place is absolutely priceless. On the front porch, “Otis” the cat will likely greet you. There are rocking chairs to rest in while you sip a soda, or maybe you'd like to pass the time by playing a game of checkers on a board set atop a wooden keg. In between, browse through the merchandise–proprietors Don and Suzie M. sell everything from marbles to hard candy to iron skillets. Don's a toymaker by trade, and he built the store because he wanted a place that would bring to life his childhood memories. The store sells Don's handmade wooden toys, which are all guaranteed not to break. He says his grandkids test all the new toys, and if they can't break 'em, he sells 'em! Even if you don't find anything to buy, try an RC Cola and a Moon Pie, a Southern treat. Like this town and the Ozark Mountain's heritage it preserves, it'll bring out the kid in you. Mountain View is located in north-central Arkansas at the junction of State Highways 9 and 14, about 95 miles north of Little Rock. To learn more about the town call 1-888-679-2859. For details about the Ozark Folk Center, call 1-870-269-3851. Blanchard Springs Caverns and Recreation Area is located about 10 miles northwest of Mountain View on Highway 14, in the Ozark National Forest. Along with 59 campsites, the facility offers two tours of a spectacular developed cave, one of which is wheelchair accessible. Open year-round; admission is $9 for adults and $5 for youths ages 6-15. For details call 1-888-757-2246.
does leon jennings still offer basket making workshops? I would like to order cornmeal such as we purchased several years ago. It was ground fresh at the mill at the end of the street. Do they have it available, since we won't be able to drive there. We are from Brainerd, Minnesota. Thanks.